Be Quick Horseshoeing is devoted to providing quality, cost-effective farrier and horseman service throughout the Front Range of Colorado. Our service area is very large from North of Fort Collins to South of Castle Rock and anywhere in between. 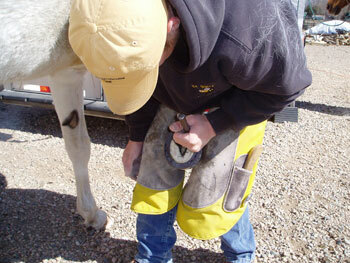 We are able to service any number of horses at any location for farrier / horseshoeing service. To ensure that we are able to meet any need your horse may have Be Quick offers a wide variety of shoeing services. Improve the horse's foot overall with the protection of shoes. Natural Hoof Care and Hoof Boots. What are the benefits of hot shoeing? For horse's with hoof problems or other issues with their feet and legs. Side Plates as well as many other performance shoeing necessities. Farriers Appointments may be scheduled by calling our office Monday through Friday 9 AM to 5 PM - Northern Colorado (970) 568-3113. Be Quick Horseshoeing schedules advance appointments. We will call one day ahead to confirm the appointment. If you need to reschedule or cancel just let us know, we are flexible. There may be a charge for appointments missed or not canceled in advance. If our farriers are running late for any reason, we will call if we are unable to be on time for your appointment. If you are not going to be there, you need only have your horses available to us in their pens. As we get to know you and your horse many options open up. Advantages of a Farrier being a skilled horseman. Safety tips about appropriate area to work with the horse. Matching the right shoes with use and needs of the horse. Any other questions you may have about farrier service. Our Haul in facility includes drop off and lay over services. Another option Be Quick Horseshoeing offers is for you to haul your horse to Be Line Equestrian Center (1721 WCR 68 Fort Collins, CO. 80524) If you haul your horses to our facility, we defer the Farm Call and only charge for home service. We are equipped to have you drop your horse off when it fits into your schedule. Your horse will have their own stall to hang out in before and after we take care of their shoeing needs. Coming into Colorado on your way to a big event and need a place to keep your horse? Bring them to Be Line Equestrian Center. We'd be glad to care for your horse or horses. Please call (970) 568-3113 or Contact Us for prices and availability.